In a recent faculty presentation, Barbara Berg and Terry Buxton shared their experiences on using student blogs for service learning. Barbara and Terry discussed how they used blogs to capture student reflections on experiences outside the classroom in support of various service learning projects. During the presentation , an audience member raised the question about why they used a blog rather than a discussion forum. Discussion forums, the audience member said, provide a similar environment within the LMS for students to post thoughts and for other students to provide comment. Blogs, on the other hand, have the same feature sets as discussion forums but may not be as easy to use. So why use blogs? The audience member brought up valid arguments for the use discussion forums, an established communication tool, for the posting of personal comments. So what warrants the use of a discussion forum rather than a blog post? And when are wikis appropriate? Wikis are text-based and can provide a resource for the posting of information similar to blogs and discussion forums. A quick search of differences uncovered a great blog (how appropriate!) post succinctly describing the differences between blogs, wikis and discussion forums. The post is titled Differences between blogs, wikis, and discussion boards, and many thanks to blog author Cynthia Medina for compiling this useful bit of information. Blogs are used as personal journals, where outside comments can be added but are not expected. The intent of a blog post is more informational rather than persuasive. Thus, Barbara's and Terry's students could use a blog to provide personal reflections on their service learning experiences. Fellow students could add comments but this was not expected. Discussion board posts are more collaborative than blog posts. Comments are expected in discussion posts and in fact, are many times required by the instructor in a class situation. The intent of a discussion post is to persuade and support a position or statement. A wiki is a living document or set of documents that are used in a collaborative setting using multiple authors. There is an expectation that a wiki will be added to, modified and otherwise become a group project. The intent of a wiki is information sharing. Be sure to read Cynthia’s entire post for a better understanding. Vinnie has been taking a look at the screen capture utility ScreenCast-O-Matic. The program packs a lot of punch in the free version and adds significant utility in the Pro version for an additional $12/year. One of the most important features is output formats as we continue our search for an alternative to Adobe Presenter. 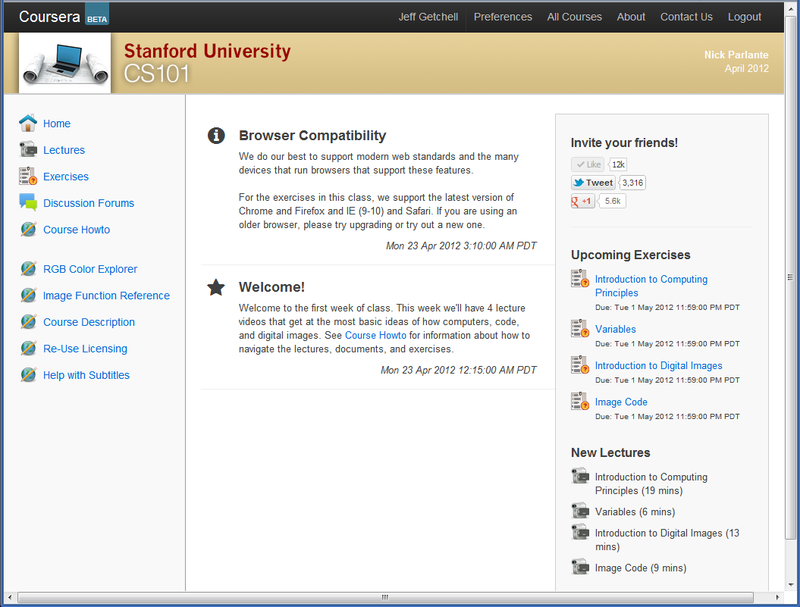 Presenter is one of the most popular tools at the College but which outputs only in Flash. This leaves out student viewers with iOS products including the iPad and iPhone. The result of Vinnie's evaluation is the following chart comparing the three products on commonly used features. Unfortunately, ScreenCast-O-Matic does not appear to be a viable alternative for the creation of narrated PowerPoints due to the lack of editing features. Thanks again to Vinnie for compiling this data. ScreenCast-O-matic is a tool for recording of the computer screen. Adobe presenter is a plugin for PowerPoint for creation of multimedia PowerPoints. I'm getting a Stanford education for free! Well, to be honest, it's only a single six-week, non-credit course. But I'm getting the expertise of a 20+ educator from a top-notch university. The course is CS 101, Introduction to Computer Science, and is open to everyone, with no enrollment caps. A quick scan of the discussion forums shows participants from around the world including Ghana, India, Phillipines, China, Pakistan, Spain, Poland, New Zealand, Australia, and others. The course is being taught by Nick Parlante, lecturer in the Stanford Computer Science department and teacher of programming best practices at Google. Nick is hosting the course in Coursera, a free online LMS. The interface is clean and easily navigable, with menu items for discussions, exercises, lectures and general assistance. Each week there are readings, video lectures, and graded assignments and quizzes. And all participants are required to abide by an honor code that ensures all coursework is the work of the student rather than a collaborative effort. But collaboration is what MOOCs are all about. Without the possibility of instructor interaction (too many students), the use of social media in the form of discussion boards, Twitter, and Facebook becomes the road to success. I'll keep you posted on how this MOOC works out. 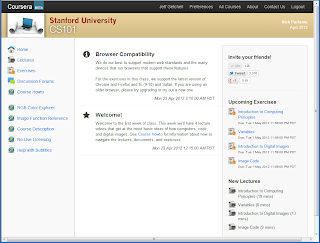 And enrollment is always open so feel free to join in the fun by going to the Coursera CS101 home page. This was my second time in attendance at eLCC conference. The only disappoint was that I wasn't a door prize winner. Otherwise the conference sessions were very good, keynotes top-notch, the food outstanding, and location....well, let's just say that watching the skiers swooshing down ski slopes and the occasional snowfall was well worth the price of admission. But, I digress. Here is a sampling of sessions attended this year. Dartfish is a video recording/edit program for education. Using Dartfish, the user can take a video clip and add any number of functions such as split screen, snapshots, overlays, and similar. The example used in the hands-on was a tennis player serving the ball. Using Dartfish, one can, for example, analyze the angle of the arm when serving, or add an overlay video to compare with another player. Videos are published to a server for public or private access. Regis Kinesiology is currently using this program, according to the company rep. I can see usefulness in PT as well. $700 for a single user. Nicole has already written an excellent summary on the session. The presenters also mentioned the tried-and-true Prezi, which is quickly becoming a popular substitute for PowerPoint, based on the number of Prezi-based sessions. BTW, one of the most incredible Prezi-like presentations is called "The Scale of the Universe 2" by Cary Huang. The presenters also mentioned ipadio, an app allowing recording of conversations on smartphones. Files are then uploadable to various social media sites. I tried getting more info about ipadio from their webiste but usable information is scarce, and it doesn't appear that ipadio is free. Still it may be worth looking into if recordable conversations are needed. Another inexpensive solution for recording of VOIP conversations is HotRecorder. I've used this a number of times for recording of remote participants for podcasts. $20 with a trial version available. Vendor presentation on lecture capture. Nothing new here. RHCHP has a faculty task force looking into lecture capture this AY and Echo360 will be examined in more depth. Chia-chi Yang gave a useful hands-on for creating e-portfolios using the freely available Google Sites. She had two very useful handouts documenting the process step-by-step, including the creation of a Google account. Sites can be kept private or opened to the public based on the account settings. Something I wasn't aware of was the creation of personal templates that are shareable with others. Instructors could create an individual course template or have students create their own. Very helpful session. The Wednesday keynote was alone worth the price of admission. Nicole provided an excellent summary in an earlier blog so I won't get into specifics. I did speak with John after the session and got his contact information. He referenced a number of studies on the effectiveness of virtual worlds in learning as well as how the brain neurons are constantly being rewired as deep learning takes place. I'll be speaking with him later on as our virtual nursing sim project moves forward. Read Nicole's previous post for a summary of this keynote. I did want to mention a personality assessment tool called the Birkman Assessment. This is similar to the Myers-Briggs and gives and assessment on 11 emotional factors. The test claims to assess interpersonal style, underlying motivations and signs of stress behavior. I hadn't heard of this before and will investigate further. Kae Novak once again provided an entertaining look, this time at massive open online courses (MOOC). This are quickly catching on as freely available, open sources of learning. Don't expect teacher interaction in a MOOC, where student participation can get well into the 10s of thousands. Kae pointed out that it's the resources that students should focus on such as student social media interactions. Applications such as Twitter, Facebook and similar social sites can be gold mines of content information. There is certainly relevant information contained within the course, but a well-designed MOOC will encourage interaction outside the course shell. Kae pointed out the free-to-enroll P2PU LMS, where a number of MOOCs exist including Welcome to mooc.ca, a history of MOOCs and facilitated by Stephen Downes who, is partnership with George Siemens, taught the first-ever MOOC in 2008. Also at P2PU is the course A Virtual Worlds Games and Education Tour. Go to P2PU and sign up for free. D2L has just released Desire2Learn Assignment Grader, an iPad app for grading assignments. It's designed to provide offline mobile access and grading of content in the D2L dropbox. All assignment grades will synchronize with the class gradebook once a connection has been re-established. Two versions are available: a free version that is limited to four submissions per assignment and a full-featured version for $10. We don't know much about this as yet but have loaded it onto the iPads for further analysis. The app is available at the iTunes store by searching for "desire2learn assignment grader"
He focused on the digital learner and that we shouldn’t stereotype the vision of who that might be. It is not necessarily young people. He used the example of his 85 year old mother who tweets or blogs. Jim’s take home point was on the concept of “tranceformational learning.” (no, that is not a typo). By closely examining what is happening in the brain when we “experience” something. He used examples of gaming and the learning that takes place during that experience. Elements in that experience might be: reading, adrenaline rush, motivation, problem-solving, trial and error, and sometimes even feeling lost. Upon closer examination of this ‘experience’ we know that there are similar patterns of activity going on in our brain during gaming as there is when we are “learning”. How might we create a learning activity that doesn’t have the label of “this is a learning activity.” Not to be sneaky in the process but identifying this “learning trance” that occurs during gaming and bringing that to the curriculum. This session was primarily about classroom assessment techniques but in the online classroom. How might we collect formative evaluations and feedback from our online students? This was a great discussion on comparing classroom vs. online techniques for immediate feedback or formative evaluations. Clickers are used in the classroom for immediate feedback during lectures, could this be done in the online classroom. I actually suggested a free tool called polleverywhere.com (In which I was presenting on the next day for this very purpose). Nate explained that this faculty support blog was originally put in place when they were transitioning to D2L and they wanted to make it easy for faculty to have a location to get “how-to” articles. He sent out a weekly “what’s new“ email blast to all faculty pointing out a bullet list of new articles that were posted. At one point they actually had over 30K hits. Because they hosted their WordPress blog directly at Wordpress at first they found out that when you have over 20K hits the advertisements will begin to get plastered on the site. Unfortunately, the ads were for University of Phoenix! They pulled the blog and hosted it on a college server. They had trouble getting the same amount of traffic to the site after that, but it could have been because the “newness” of D2L was dying down and people where getting comfortable with it. Perhaps don’t call it “a blog” but simply a faculty resource site. Some people have expectations and assumptions about “blogs” that might deter them from visiting the site. Tag posts with version of D2L, as this will change over time and some articles may become obsolete. Remove those outdated posts as needed. provide clear instructions (maybe even a demo) on how to navigate and search for content inside the blog. This session was great because I learned about 5 new and interesting Web 2.0 tools that have some potential. Join.me: This is a free tool where you can utilize screen sharing on the fly. In addition there are voice conferencing features as well. With the free account you can do internet calling, screen sharing, you can have up to 250 viewers, share controls, chat and view on iPad/iPhone or Android. Projeqt.com: Dynamic Presentations for a real-time world. Create dynamic slideshows for storytelling but also incorporate layers or “stacks” as they call it in Projeqt. You can pull in photos, text, twitter, RSS feeds, YouTube, Flickr, and several more tools! Evernote: Evernote is a popular free notetaking tool that students utilize. It is cloud based and there are mobile apps for it as well. Notes may include audio, photos and video. Searchable. Daytum: ok this tool could be a stretch for practical use but it was really interesting and I think perhaps could have some potential for tracking research data over time. Daytum is dubbed a web-based method for collecting, categorizing, and communicating everyday data. It allows for a graphical interface that represents all the data that you choose to track. Popplet.com: This is a free web-based mindmapping tool and seems a little easier to use than other mindmapping tools and it is more robust. You can collaborate in real-time. You can print and export. You can pull in photos and videos as well. Keynote: Kevin King, Founder & CEO Transformation Point, Inc. I really liked this keynote as he talked about teams, communication and human nature. Kevin offered some detailed strategies for setting up success among virtual teams. (but really any team for that matter) Understanding personality characteristics both in yourself and in your teammates is a good place to start. Kevin explained the dimensions of trust (ability; benevolence; integrity) and how that is the key to a successful team. Using some of these models can help guide a team in aligning their strengths and develop strategies for success. The representative from D2L went over the new features and changes that are coming with the 10.0 upgrade. This is considered a major upgrade. There will be a new look and feel to the LMS. They are focusing in on a very “personal” experience for the student. The official release of version 10 will be in May. Of course, that doesn’t mean that Regis is upgrading in May. More information on that will be communicated when we know. Part of the new look and feel includes much more flexibility in branding the LMS. Users may even add a photo on the background. The menus will be changing to make it easier to navigate and a personalized experience. For example, on the home page there is what they call a “minibar” with dropdown menus to personal grade announcements, notifications, a course list, messages, announcements etc. · The calendar will be able to sync with Google calendar and/or Microsoft Outlook. · There will be a plugin for Office that will allow a direct submission to the dropbox from Word. The dropbox will be integrated with Google Apps to allow direct submissions. Improved competencies tool that can go all the way up to the institution level. Instructors will have ability to record video when providing feedback. A mobile app has been designed for instructors for easy grading on the iPad. It is called the “D2L assignment grader” the lite version is free; $10 for full version. The Journal tool is being phased out. Shock and Awe; How to engage online students? Consider allowing students to generate their own rubric and submit for approval to the instructor. What do the students think they should be graded on? Would they perform better when they decide on the rubric? Define the gold standard- what is the difference between simply meeting expectations and going above and beyond? Jennifer mentioned that there are some big limitations in the D2L rubrics tool as it does not allow for a range of levels. It shows “# or more” instead of range.